Viennetta Vanilla Ice Cream Dessert. Smooth vanilla flavour ice cream between crisp chocolate flavour layers (13%). Without artificial colours and flavours. The Original Viennetta. Made in the UK. 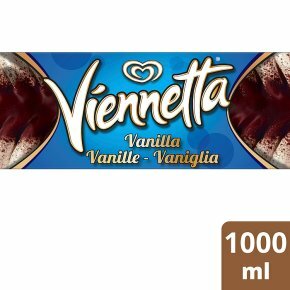 A firm family favourite.Viennetta Vanilla Ice Cream 1000ml. First created in 1982 by Wall?s in Gloucester, and it has been a family favourite since. Available in two flavours, Vanilla and Mint, Viennetta is a truly unique ice cream dessert bring a certain ?poshness? to your dinner table. As Sue Perkins once said, ?there?s nothing posher than a Viennetta?. Viennetta?s unique shape is created by layering vanilla ice cream and chocolate sauce at different speeds on a continuous like, which is mesmerising to watch. Viennetta is a part of the Walls family of ice cream alongside other tasty treats like Soft Scoop Ice Cream and Cream of Cornish and like many of our other delicious products, is make in Gloucester. Viennetta Vanilla Ice Cream is the perfect dessert for both family and special occasions. Viennetta is a must-have staple in your freezer which you will always find yourself wanting more, after all, one slice is never enough. If you haven?t tried it, what are you waiting for? So go on, try a Viennetta today and experience the delicious taste for yourself! In order to find out more visit www.icecreamjoy.com, contact us on Twitter or Facebook @Walls or give us a call on 0800 731 1507. Pack size: 1000ml.